Click to download the full PDF tablature for "Mahororo"
In my new book, "About 30 Traditional African Songs for the Hugh Tracey Karimba", there are two different versions of "Mahororo". After the book was published I went and made a YouTube video of a new version that was nothing like either of the published ones. I was very familiar with the song, and had internalized its structure. I then was able to create my own version improvisationally. My friend Bela said "I like your version best, Mark!" I wanted to share it, but the problem was that it was in my head and on video, but not in tablature. Not until now. I went through the video and transcribed which notes go where, and now everyone can learn to play my new version of "Mahororo" on karimba. 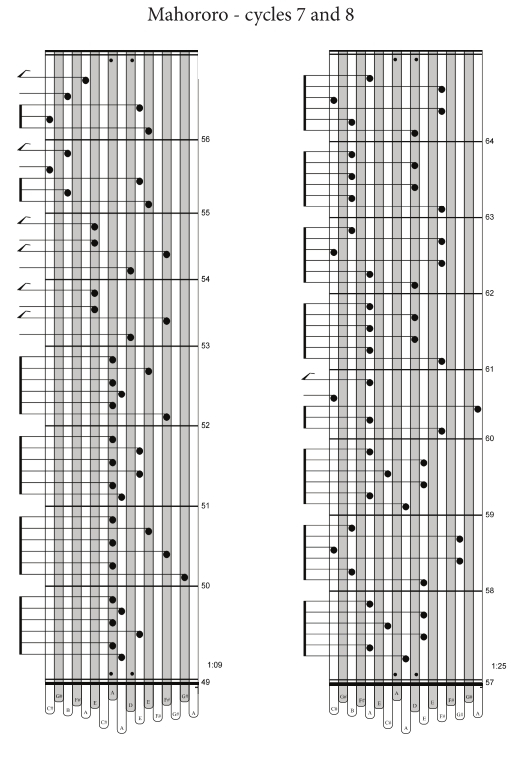 The times near the lower right corner of each stanza of tablature refer to the time in the video where each particular variation starts. The first cycle begins at 1:09, just over a minute into the video. Click Tab for PDF download. The video below is "at tempo" - meaning, yes, you can see what I am doing, but I am playing pretty fast, so hold on tight!